Major league talent drop is not linear and it shouldn’t be treated as so in fantasy baseball but it does for many owners because we love our simple ordinal rankings. The talent drop from the best shortstop to the 10th is more than the drop from the 10th to the 20th. As soon as an owner moves away from using just rankings and goes to an overall production value they will gain a leg up on the competition. The whole idea can be explained by the talent distribution curve. Note: While only 276 players are needed for this example, I extended the data out for deeper leagues. For those in 12-team -Only leagues, they will be picking at the 552 mark where the talent really begins to drop. I’m not even sure if it has a shape. Maybe a sideways ‘S’. There is an extreme drop for about 100 picks and then starts to level off. Owners want to acquire as many players in this first group. In this part of the draft, talent needs to be prioritized over a position since talent differences exist more at this level. Put another way, half the picks are in the $37 drop from Trout’s $46 value to the $9 rank. In the last $8 form the $9 to the $1 players are the other half. This curve has always existed. There has never been a linear distribution of talent in real baseball and it extends to fantasy also. There way more 1 WAR players than 6 WAR or even 3 WAR players. In a draft, secure as much of the top end talent. 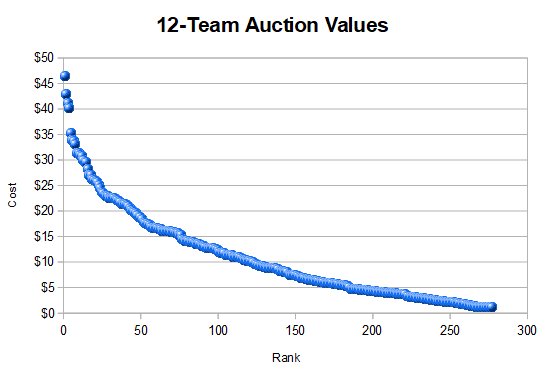 In auctions, the strategy can differ since owners don’t have to try to pick the best player at a given time. They can pick and choose how and may bunch their talent together. There are two flattenings in the talent curve. To show them, here are just the 276 picks for the 12-team league. The first leveling happens around pick 50 and goes to pick 150. After pick 150, it extends for the next 550 picks. Here are those last 550 picks viewed graphically. An even flatter segment could be created if I cut off the first and last few picks. Instead, they help to show when the drop is no longer linear but starts to turn up and down. Now, the drop around pick 500 is important in deep leagues. Owners don’t want to be picking up their talent once it transitions into the Quad-A or bench player talent pool. The non-linear drop is even more important when just using position rankings, like with shortstop. Carlos Correa is a near $20 value as the #3 shortstop (previous ranking discussion with Lindor and him). Going down to the #8 spot is Jean Segura at $7. If moving down another 5 spots is Didi Gregorious at #13 and $4. The first five-player drop was $13. The second one was $3. Some owners like to use several tiers and that approach can be a good compromise. The one issue with tiers is to make sure the values jive from one position to the next. In today’s fantasy game where little to no position scarcity exists besides at catcher, the top five first basemen may be in a tier with only two shortstops. In the next tier, no first basemen may meet that level’s criteria while four shortstops may be in it. Don’t just assume the same number of players from each position will be in each tier. 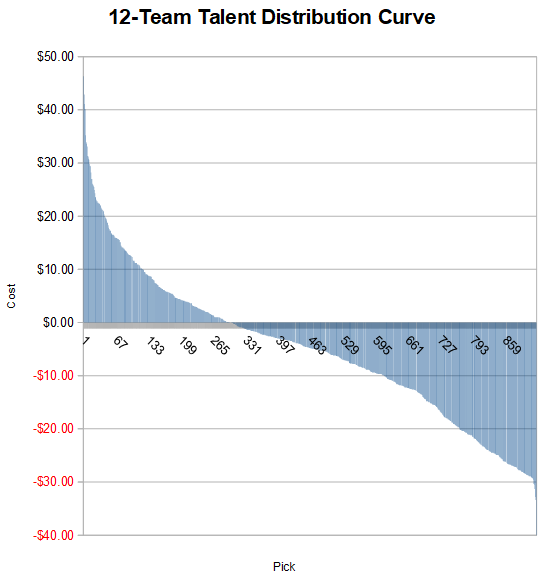 The talent distribution curve is a simple concept. The curve as a logarithmic shape to start but later levels off. The problem is that fantasy owners are given players in ranks. These ranks change linearly but the talent doesn’t. It’s better to use a system with gives players a talent value (like dollars) and use it to determine who to pick. 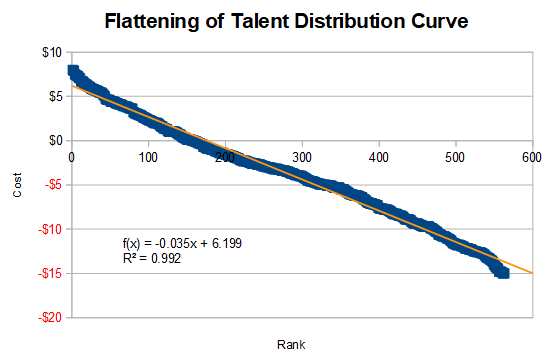 We hoped you liked reading Talent Distribution Curve Improves on Ordinal Ranks by Jeff Zimmerman! The Sleeper and the Bust Episode: 522 – Glasnow or Glaslater? So consolidating talent is almost always a good idea? I just made two trades, I got Albies for Stroman, Verdugo and a 9 pick swap in the second round of our fyp draft.